The Chinese communist regime has launched one campaign after another to force Falun Gong practitioners to give up their faith in the mind-body cultivation practice based on the principles of Truthfulness-Compassion-Forbearance. The “knocking on doors” campaign started in March 2017 and had police nationwide check on practitioners and question whether they still practiced Falun Gong. Many were arrested for refusing to renounce their faith. The persecution of practitioners continued unabated in 2018. The regime launched a new campaign to “combat criminal gangs” around July, and police in many regions turned to Falun Gong practitioners to fill their quotas for arresting gang members. With the “anti-gang” campaign in full swing, many more Falun Gong practitioners have become victims. Information received by Minghui.org confirmed that in October, 296 practitioners were arrested (with 165 still in detention at the time of writing), and an additional 95 practitioners were harassed. Among the 391 practitioners affected in total, 106 had their homes ransacked by officials. In some cases, police pried open their doors or pretended to be utility personnel to deceive them into opening their doors. The newly confirmed cases have brought the numbers of arrests and harassment cases against Falun Gong practitioners since January 2018 to 3,944 and 3,783, respectively. Elderly practitioners were not spared in the human rights violation. Among those targeted in October 2018, 12 are between 65 and 78, and 8 are 80 or older, with the oldest practitioner being 87. 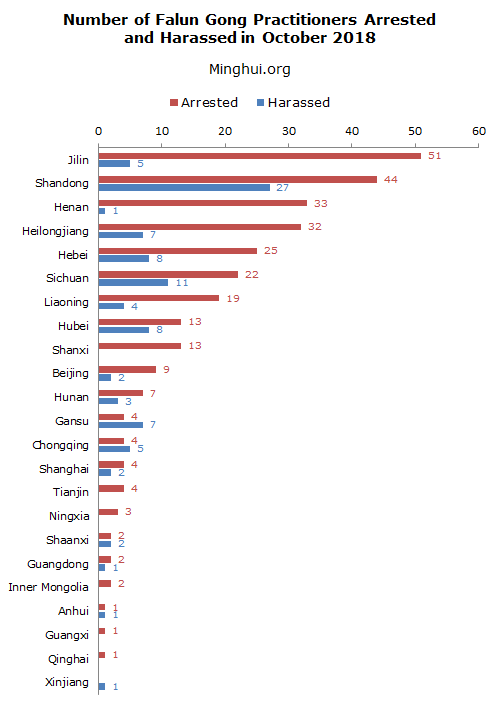 Jilin (51), Shandong (44), and Henan (33) recorded the highest numbers of arrests in October, while Shandong (27), Sichuan (11), and Hebei (8) had the most cases of harassment. During the anti-gang campaign in Jilin Province, at least 48 practitioners were arrested and two were harassed in Changchun City in October 2018, including nearly 20 practitioners and their family members arrested in one day on October 12. In Taiyuan City, Shanxi Province, six elderly Falun Gong practitioners were arrested between October 18 and 19, 2018. Four of them were released shortly after they failed the physical exams for detention admission. 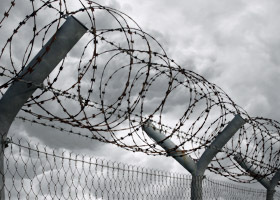 Two were sent to the local detention centre. The oldest practitioner targeted in October 2018 was 87-year-old Mr. Xiao Hengping, a resident of Leiyang City, Hunan Province. The village Party secretary harassed him in early October and threatened him not to talk to people about Falun Gong. Mr. Min Shigao, 83, from Zhongxiang City, Hubei Province, was stopped by the police at a temple fair on October 17, 2018, when he had just finished browsing the fair and was preparing to leave. The police took his bag and electric bicycle key before giving him a savage beating. His hands were injured and bled profusely. After taking him to the police station, an officer pushed him against the wall and shouted, “I will bury you alive if you don’t die [from the beatings].” Mr. Min was released four hours later. Ms. He Shuqiong, also 83, from Chengdu, Sichuan Province, was arrested on October 8 while talking to people about Falun Gong. She was detained at a brainwashing centre in Jinniu District for 9 days and released on October 17. The officer who sent her back ransacked her home again and confiscated her Falun Gong materials. Along with the rapid advancement of artificial intelligence, the Chinese regime has installed more surveillance cameras on the streets and deployed other surveillance tools. Many Falun Gong practitioners are monitored in real time wherever they go. Ms. Jiang Linying, from Heihe City, Heilongjiang Province, was arrested on October 10, 2018, after the police tricked her into opening the door by impersonating gas company personnel. The police showed her photos taken by surveillance cameras of her spray-painting over propaganda posters defaming Falun Gong at a local bus station. She was later taken to Heihe City Detention Centre, and the police is attempting to file charges against her. On October 24, 2018, two officers broke into Ms. Xiong Wenfeng’s home in Wuhan City, Hubei Province and attempted to take photos of her. The officers said to her that they saw her passing out Falun Gong flyers through surveillance cameras. When Ms. Xiong said she was passing out commercial flyers for her part-time job, the police threatened to send her to a brainwashing center if they found her passing out Falun Gong materials. Ms. Xiong was forced to leave home to avoid more harassment after the police left. Ms. Fan Yanli, from Bin County, Heilongjiang Province, was stopped and arrested by police on October 12 at a boarding gate in Harbin City East Railway Station en route to visit her two sons in Beijing. Her ID had been flagged to mark her as a Falun Gong practitioner. She was given 15 days of detention at the Yaziquan Detention Centre in Harbin City following the incident. Among those who were targeted in October, some have been repeatedly arrested or harassed in the past 19 years for their faith. Prior to the First China International Import Expo in Shanghai in November 2018, the local police harassed Ms. Jiang Linying at her home on October 25 and threatened her not to travel to other cities during the expo. When Ms. Jiang traveled to Changzhou (about 120 miles from Shanghai) to do some paperwork for her retirement, she was arrested at the Changzhou Train Station on October 31 and has been kept in custody since. Before her latest arrest, Ms. Jiang had served more than 10 years in prison and was tortured, including being beaten and injected with toxic drugs–all for refusing to renounce her faith. 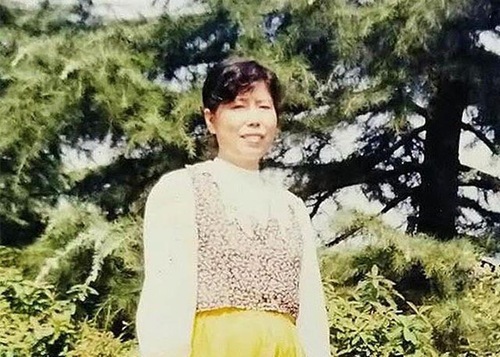 Ms. Tan Changrong, 69, was arrested on October 15 for filing a complaint against Chongqing Women’s Prison for the torture she suffered during her three-year imprisonment there, including sexual assaults, electric shocks, and beatings. Prior to the three-year term, she had served another nine years at the same prison for not giving up her faith. Ms. Yu Ping, a resident of Guangzhou City, Guangdong Province, was arrested on October 21, after the police found her carrying Falun Gong flyers in her bag. She was taken to a brainwashing centre. When her lawyer and family attempted to visit her, the guard denied the visit and threatened to beat the lawyer. Prior to her latest arrest, the 55-year-old woman was repeatedly arrested and imprisoned for more than five years at Guangxi Women’s Prison, where she was brutally tortured and force-fed.